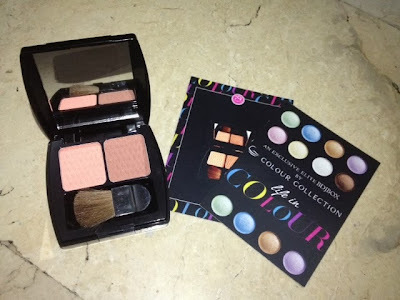 BDJ's 3rd Elite Box Featuring Colour Collection* | Vanity and Everything in Between. Early this month, I received BDJ Box's biggest package (yet). I actually had no idea that I would receive this Elite Box. I've seen a preview of this before on Facebook (probably) and I was just in awe! Ever since I tried Colour Collection's lipsticks and BB cream, I knew the makeup brand is a good brand! Click read more to see what's inside this big box! 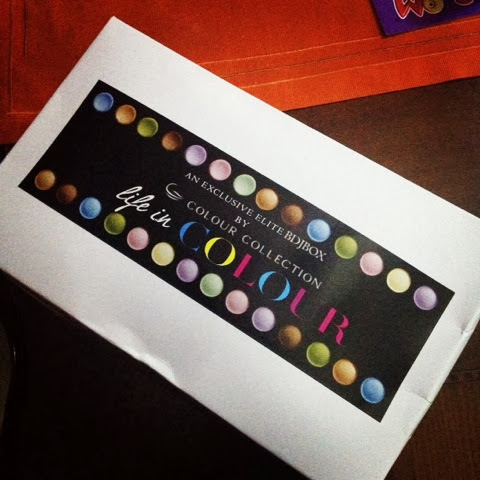 This is BDJ Box's first all makeup box featuring Colour Collection! It also came with an acrylic case so how amazing is that! If you don't know yet, BDJ Elite Box is unlike other subscription boxes. First of all, this is not available monthly. Second, you skip the surprise as BDJ shows what's inside the box. 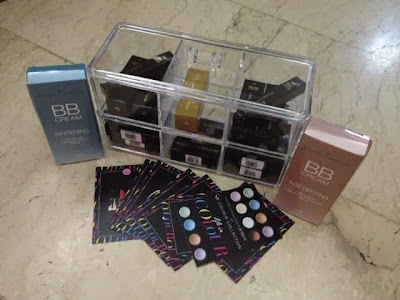 This is the 3rd BDJ Elite Box and it contains 16 pieces of amazing makeup! "Be beautifully radiant throughout the day! This whitening BB Cream has a combination of Glutathione and Arbutin to make your skin radiantly fairer and smoother with your every use. Heal acne blemishes and protect your skin from ultraviolet rays with this BB Cream that promotes cell renewal and reduces pigmentation. It will not only brighten your skin but will also retain your skin's required moisture level. 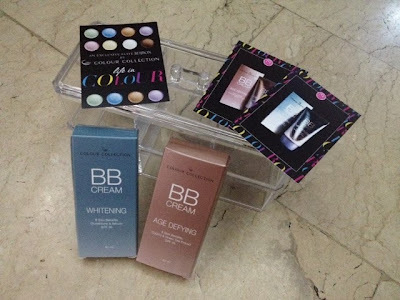 Be as radiant as you want with Colour Collection's Whitening BB Cream." I was already able to try the Whitening BB cream from the September BDJ Box and I love it to bits! I even thought of joining the BDJ 7-day challenge because I wanted to try the Age Defying BB cream. But when I received this Elite Box before the deadline of the 7 day challenge, I realized that I no longer need to join! Thanks BDJ! "This luxurious Vitamin E Lipstick was created to soften lip, smoothen lines and prevent chapping. It's formulated with a protective sunscreen to protect your lips from the sun's harsh rays. With a variety of shades and 2 finishes to choose from, Colour Collection has you covered." "Have a kissable and healthier lips with Colour Collection's Lip Therapy with Argan Oil that deeply conditions skin and heals dry, chapped lips. It is infused with Argan Oil, the miracle oil from Morocco, which holds the secret to your beautiful and youthful lips with regular use." 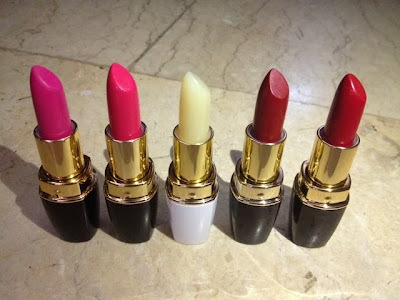 I have already tried the Vitamin E Lipstick and I love it! My favorite is is Red Wine because I love how it fares on me. When I saw the shades and realised that I have a back up for Kissmark and Red Wine, I got so giddy! 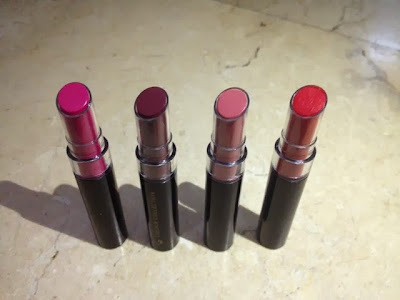 However, I think the Vitamin E Lipstick has 3 finishes - satin, matte and sheer. As for the lip therapy, it reminds me of my Fresh Sugar Lip Treatment. I'll do a separate review on what I love more. I gotta say, I'm digging the white tube of Colour Collection! "Get rich, vibrant, and long-wearing color that applies smoothly and doesn't fade away easily. With its combination of rich moisturizers in a lightweight formula, you're assured that your lips are hydrated and conditioned all day long without any heavy feel. So no matter where you go and what you do, your lips will always look perfect with Colour Collection's Ultimate Wear Lipstick." The packaging somewhat reminds me of MAC's slim shine because it's, well err, slim. Basing it from the box, I initially thought it was either an eyeliner or mascara! I'm just so glad it's a lipstick! My favorite among the 4 is Kiss & Tell as it's the one I've been using frequently. "Play up your eyes with these harmonized Eye Shadow Palettes with shades that blends easily, creating naturally mesmerizing eyes. If you want a sheer wash of color, use dry sponge applicator. For dramatic longer-lasting color, use a wet sponge applicator." Receiving an eyeshadow palette is awesome but receiving three is even more awesome! I love the different shades of the eyeshadows. Among the three though, the palette that I would be using more often is Terra Cotta (last on on the photo) because it's a very neutral palette. If you're a working lady, a neutral palette is a must-have! I ironically like Ivy Blooms (first palette on the photo) but it's not something that I would wear on a daily basis. "Score gorgeous, sculpted cheeks with Colour Collection's Blush-on Duo. The perfectly matched blush and contour shades ensure a cohesive ooh for your face. Swipe on the shimmery pink shade on the apples of your cheeks, while you apply the bronze shade on the hollows to bring out your striking cheekbones." This blush-duo kind of confused me when I saw the shades. I thought it's just two shades of blush in one palette. I didn't think that the shade on the right is a bronzer. Well, it could still pass as a bronzer but not fit for contouring. It has shimmers on it and I don't like shimmering bronzers for contour. As for the blush, I find it too light for my skin tone although I may be speaking too soon as I haven't use this blush-duo until now. 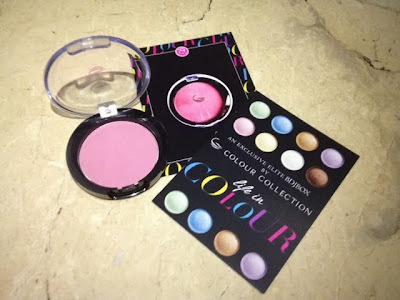 "This Colour Intense Powder Blush will brighten up your face and enliven your complexion, giving you an effortless, giving you an effortless radiance. Infused with Vitamin E, it also helps to nourish your skin while providing a pretty flush of color on your cheeks." This blush is love! I may be biased on this remark but I really love pink blushes. This blush can be applied lightly and it gives the natural flush. This is the 2nd BDJ Elite Box that I received. I gotta say that I definitely like this better because it's full of makeup! This Elite Box costs PhP1,880. Some people find it pricey but if you actually compute all the items included in the box - it amounts to PhP6,157.00! So, you're getting almost a 70% discount on all items! This BDJ Elite Box is very limited but I still saw a few boxes at the BDJ Event at MOA two weeks ago. You might want to buy this box for your own makeup collection or as a gift. You're getting 16 makeup products so if you have 16 friends, you can give one each to your friends this Christmas! To order, just send an email to hello@bdjbox.com. San San and Natasha Beauty Haul!